My grandmother always told me God takes care of babies and fools. And sometimes you gotta act a d*mn fool to get what you want in life. So, when it was announced that Former First Lady Michelle Obama would be coming to St. Paul for her Live Nation Becoming book talk, I became a one-woman welcome crew. I couldn’t just get tickets and go sit up at the Xcel Energy Center like 20,000 other folks and listen to her talk. No, that ain’t even my style. I’m Mrs. Obama’s number-one fan! From the time she was working on her husband Barack Obama’s first election campaign until she waved goodbye from the chopper after his two terms as president, I have loved and admired Mrs. Obama. She’s elegant, educated, beautiful, funny, loving, caring, kind, humble, downhome and can DANCE. I could go on and on with the accolades, but more than anything, I appreciate the way Mrs. Obama “wifed” her husband. See, Mrs. Obama is responsible for saving my marriage. Growing up in a single parent home, many African American girls don’t have the image of what a healthy marriage looks like. The first time some of us saw a loving Black couple with a woman and a man who supported and loved one another was Heathcliff and Claire Huxtable. And they weren’t real. So many of us thought a love like that could never be achieved. Then the Obamas stepped onto the national stage. Michelle was out on the campaign trail being her husband’s biggest cheerleader. She literally loved her husband to greatness, as President Obama has said repeatedly. Seeing her example of how to be a supportive wife made me realize that I needed to do a better job. Paying homage to the woman was the least I could do. And I did it big!I went out and got tickets to the tour for me and six of my friends in the Becoming book club. Then I got t-shirts for all the ladies in my book club to wear that night at the concert. Still, that didn’t seem like enough. So I bought blue jean jackets, sent them down to Houston where I’m from so that my momma and her sister could have them customized. But then my world was rocked and my status as a superfan was challenged. See, my friends in Houston informed me that someone created a Michelle Obama mural in anticipation of her visit to the Bayou City. I was not to be outdone, you hear me? So I got on the phone and called muralists in the Twin Cities. Begged them, in sub-zero temperatures to paint a portrait of Michelle Obama on the side of my house to welcome her to the Twin Cities. I called printer after printer and nobody could do it. Either it was too fast of a turn around time or they didn’t have the materials in stock. 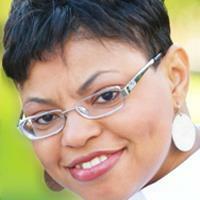 But finally, God led me to Gina at Image 360 in Woodbury and she’s as crazy as me. She and her staff not only did it, but they also designed it and had it ready the next day. 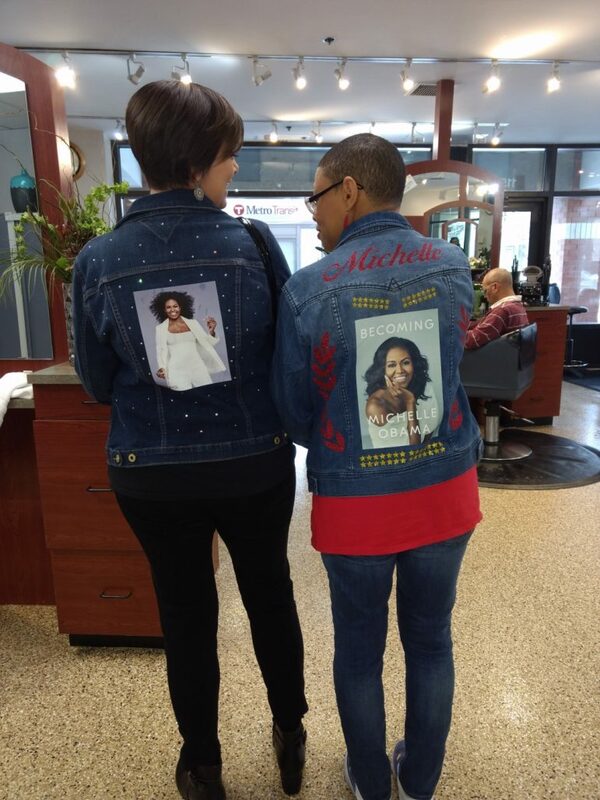 After the poster was put up, I regained number-one superfan status and began tagging everyone associated with Michelle on social media, even the Obamas’ dog! But I wasn’t getting any feedback. Nobody but me cared about my poster, Michelle Obama shoes, mural, or my shirts. “What are you going to do with this big a#$ poster when you’re done?” asked my husband. “Cause we can’t keep it up forever. The moment Mrs.Obama gets on a plane and heads to her next tour stop, it’s coming down.” I hadn’t thought that far ahead. What an excellent idea. That’s what Mrs. Obama is all about, helping young girls. Well, word got out to the local media about the poster and the purpose behind it. Local media outlets came calling, asking about the mural and how it would help raise funds for girls in need. This was bigger than me and my Michelle Obama tennis shoes, hats, purses and posters. This was about me stepping back and being a blessing to someone else. And that was the key to getting Mrs. Obama’s attention. Then one day, I was sitting at Ike’s in downtown Minneapolis having lunch with my book club ladies and my phone started blowing up. One of my girlfriends tells me that Mrs. Obama herself sent me a personal message on Twitter thanking me for the welcome banner, but more importantly, commending me on helping the young ladies in Girls In Action. I screamed, laughed, cried, lost all feeling on the left side of my body and peed on myself a little bit. Cause baby, Mrs. Obama, our Forever First Lady, sent ME a tweet! 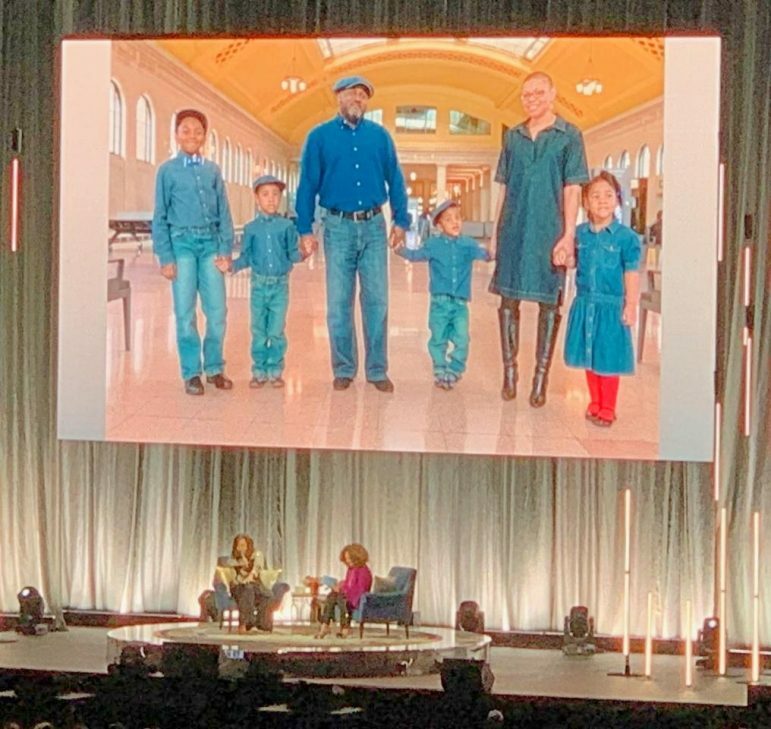 A few days before Michelle’s arrival in the Twin Cities, event host Michele Norris put a message on Twitter asking people to send in questions that they wanted Mrs. Obama to answer during the book talk. Well, y’all know I was the first one to send in a question. I asked her how she and President Obama kept their marriage strong in the midst of all the demands they face. Well, baby, on that stage, in front of 20,000 folks, Mrs. Norris said my name and asked Mrs. Obama MY question. I lost it; I started jumping up and down, running up and down the stairs high-fiving people like a winner on the Price is Right! I couldn’t hear what advice she had for me cause I was too busy yelling. But then, chile, she put the cherry on top because, during that segment, they put our family photo on the jumbotron. That’s right — the one we took a few years ago at Union Depot in St. Paul and we were looking like brand new money. Me, Shawn, Andrew, Brandon, Cameron, and little Daniel were all standing there in our denim outfits holding hands. And Mrs. Obama, in response to seeing a photograph of my kids said: “They’re beautiful.” Then, before I could blink, the photo of the #MinnesotaLovesMichelle poster that I put on my home to welcome her to the Twin Cities replaced our family photo. I guess they got the picture from social media and displayed it for everyone to see. She’s funny, like me. That’s why we’re friends…in my head. Television, media, Mrs. Obama’s tweet and having my babies on the jumbotron and she declaring them beautiful in front of 20,000 folks? Yeah, God takes care of fools — I am a testament to that! Everything I did was absolutely foolish to anyone watching, but this fool got more than she ever dreamed. The poster is down, my gear is in a box and Mrs. Obama is gone on to complete the rest of her book tour. But I’m still on cloud nine and can’t believe this happened to me and can’t stop being over the moon excited about my Michelle Obama experience. 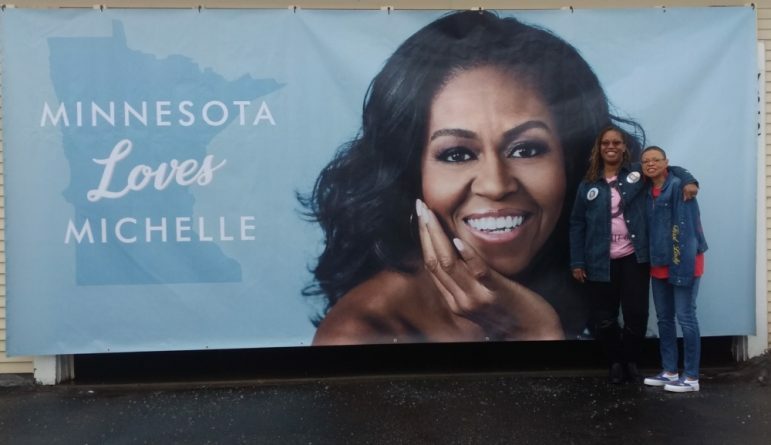 My hope is that Mrs. Obama circles back to the Twin Cities and signs the poster prior to the big Girls In Action fundraiser so we can raise more money for a great cause. It is, after all, her mission: to help young girls in need. The 7th Annual Girls In Action Fundraiser takes place Friday, May 3, 2019 at the Minneapolis Marriott West. Visit giaction.org for more information.